A mix of clouds and sun. High 64F. Winds SW at 5 to 10 mph..
Spring flooding seen pouring down Cottonwood’s Main Street in March 2014. 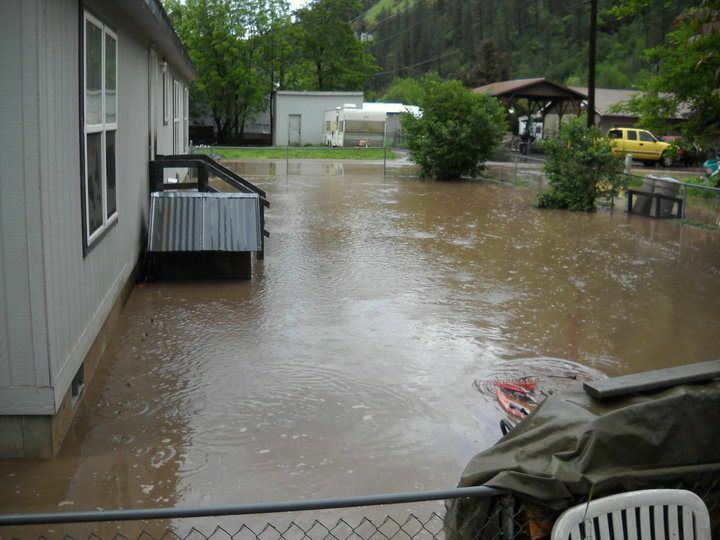 View of flooding in Stites in 2010. It takes only a few inches of water to cause thousands of dollars in property damage. As spring temperatures begin to rise, so does the potential for area flooding. The Idaho Department of Insurance (DOI) urges consumers to protect their homes and families by securing flood insurance long before area snowpack begins to melt and seasonal rains occur. Consumers should be aware that only flood insurance covers flood damage, while most standard homeowner’s policies do not. Also, flood policies typically mandate a 30-day waiting period before coverage becomes effective. DOI Director Dean Cameron says flooding does not have to be a “catastrophic event” to cause severe financial issues. Flood insurance is affordable, and anyone can purchase it. For information on flood insurance policies, visit the federal National Flood Insurance Program (NFIP) online or call 800-427-4661.